It’s time for another update from our sponsors at BigBadToyStore.com! If you’ve been paying attention lately, you’d see a ton of new upcoming figure releases in the S.H. Figuarts and S.I.C. toy lines for some of your favorite Kamen Rider figures! Guess what? You can pre-order them today from BigBadToyStore.com! Check out the full list below! For the best customer service you can find, check out our site sponsor BigBadToyStore.com and remember to use their Pile of Loot shipping method to save yourself tons of money on shipping – combine multiple orders to ship together as opposed to multiple shipments! Check out the full newsletter, released today, by clicking “Read More” to see what other hot toys and collectibles are now in stock or up for pre-ordering! Updating our article from earlier today, the Tamashii Web Shop has just released official images and release info for the upcoming S.I.C. Kamen Rider Ryugen Budou Arms! The 3rd S.I.C. 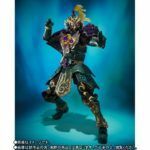 entry from Kamen Rider Gaim, Ryugen Budou Arms will be released February 2017 as a Tamashii Web Exclusive for 8856 yen. Included with Ryugen will be 5 additional hands, an display pedestal for the armor mode of the figure, his Budou Ryuho handgun, and 3 Lockseeds! This figure packs quite a punch for his hefty price. Get with your preferred Tamashii Web Exclusive middleman or service today to secure your order! › Companies: Tamashii Nations, Bandai Japan › Characters: Kamen Rider Ryugen › Toyline: S.I.C. Type Tridoron’s release follows a lengthy and uncertain wait that made many fans anxious. Additionally it has been confirmed that Type Tridoron Tire Mix-Up Set will be sold temperately. We just saw images of Deep Specter at the Akihabara Bandai display last week. And S.I.C. 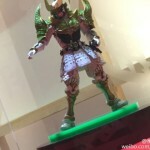 Ryugen has been seen previously only at Tamashii events so it’s a welcome surprise to see his release as well. All 4 of these figures are slated to be released as Tamashii Web Exclusives. We’ll update you as soon as pricing, release dates, and official images become available for each of these figures! › Companies: Tamashii Nations, Bandai Japan › Characters: Kamen Rider Drive, Kamen Rider Ryugen, Kamen Rider Specter › Toyline: S.H. Figuarts, S.I.C. 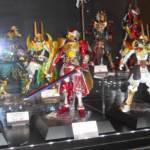 Tamashii Nations 2015: S.I.C. 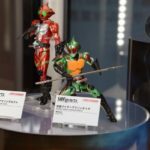 Kamen Riders Baron, Zangetsu, & Ryugen Revealed! These 3 are already looking just as impressive as Gaim himself. Time will tell if these figures, or even Gaim, see an actual release. But for now enjoy these images as our coverage of Tamashii Nations 2015 continues! › Companies: Tamashii Nations, Bandai of Japan › Characters: Kamen Rider Gaim, Kamen Rider Baron, Kamen Rider Zangetsu, Kamen Rider Ryugen › Toyline: S.I.C. With all the recent news of Kamen Rider Gaim getting more and more releases (bring on those S.H. Figuarts! ), we’re happy to bring you a video review of the recently released DX Yomotsuheguri Lock Seed, which was used by Kamen Rider Ryugen as a last resort to try and defeat who he believed was his arch-nemesis. With that version of the character having been released now in Arms Change format, and announced yesterday to be receiving a S.H. Figuarts release, whet your thirst for some hell fruit with what is quite possibly the highest quality and most professional looking video review you will see. Please be warned – if you haven’t seen Kamen Rider Gaim, or you haven’t finished watching the series, this video CONTAINS SPOILERS!!! Well, technically the toy does, but you get the idea. Check it out! Please be sure to support our buddy ZeronXepher by subscribing to his YouTube channel. He also does Patreon, a fan-funded service – if you like what you see help him out to keep these amazing quality videos coming! 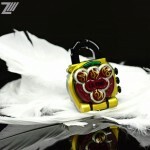 Did you buy the DX Yomotsuheguri Lock Seed? What do you think? Sound off in our discussion thread! Hot on the heels of the Arms Change release of this form, Tamashii Nations has just officially confirmed the release details of S.H. Figuarts Kamen Rider Ryugen Yomotsuheguri Arms! Ryugen Yomotsuheguri Arms will be released as a Tamashii Web Exclusive in June for 5400 yen. Ryugen also includes the same type of awesome Overlord Weapons that the Arms Change figure does! 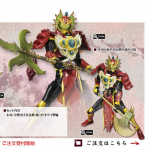 Though we only have a small selection of official images for this figure it’s already looking to be another incredible addition to any Kamen Rider Gaim collection!